While there is a great deal of hype surrounding the potential for digital disruption, challenger banks face significant challenges to growth, with the banking industry trying to determine whether they should ignore, acquire, partner or compete with their new technology- driven competitors. Challenger banks see the advantages of leveraging with legacy banking’s large and loyal customer bases, whose organizations are experienced with risk and regulations, a broad product set, established trust and the deep financial pockets. Alternatively, most incumbent banking organizations need the ‘fintech advantages’ of not having to work with old, legacy operating systems, an innovation agility unheard of in traditional banks, a better understanding of today’s technologies and a laser focus on narrow solutions. 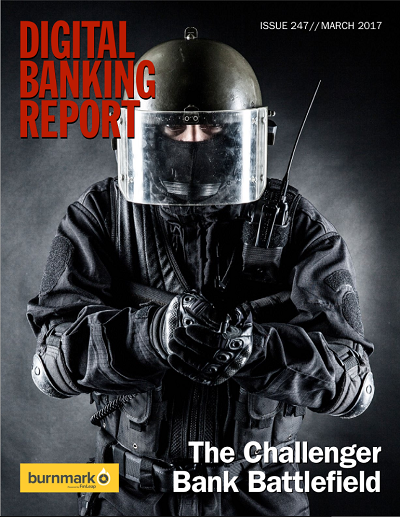 The 82-page Digital Banking Report, The Challenger Bank Battlefield provides a review of over 30 challenger banks in the marketplace. With new entities being developed every day, the battlefield is continuously changing, with new organizations. funding and licensing taking place. That said, many of the underlying competitive strategies remain consistent. This comprehensive report was created in partnership with my friend, Devie Mohan, President and CEO of Burnmark. Analysis of the global fintech and challenger bank ecosystem with key executive interviews and over 30 start-up company snapshots.